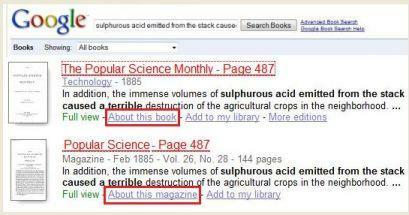 A month ago, Google announced that it has begun putting magazines in Google Books. In one way, this is a new direction for Google. But looked at broadly, it’s really not so new — Google has been putting old journals in Google Books for a long time. The basic difference between the newly announced “Google magazines” and Google’s “old journals,” of course, is the date of publication — The titles that are being treated as “magazines” are generally published in the last 50 years or so. But some of these also include much older issues, in some cases, such as Popular Science, going back to the 1800’s. A bit of digging — searching for words in an article — finds a nice case of a title that’s in Google Books both ways, as a magazine and as an old journal. Snippets from the “About this book” and “About this magazine” pages below show differences. Old journals are given the same treatment as books, with each volume of the journal being considered a book. The record here is for volume 26 of Popular Science Monthly (the old name of Popular Science). Old journals are scanned into Google Books by libraries, in the case shown here, Harvard University. As with other books scanned by libraries, the About page has a selection of thumbnail images, giving an idea of what sort of graphics are in the book. Also note the button to Download the entire volume in PDF format. In contrast to journal/book format, in which the volume (made up of several issues) is treated as the basic record unit, in magazines, the basic record unit is the issue. This record is for the Feb 1885 issue of Popular Science. Comparing this with the journal/book format, this lacks thumbnail preview images and it also does not support downloading a PDF of the issue. It does, however, have the great advantage over the journal/book format, that all issues are connected in the Browse all issues menu. Posted in Google Book Search, Journals, Magazines, PicsYes, Uncategorized. Google Books is full of surprises! In surveying medical journals in Google Books, I discovered that volumes of British Medical Journal circa 1880 scanned at Harvard have extensive sections devoted to advertisements. Most libraries, when they bind issues of journals and magazines into bound volumes, very reasonably remove pages that have only advertisements, to save space on the shelf. So it’s good to have a Harvard, that can afford to save the rare gems of 19th century ads, so that they can be put online for the world to enjoy! 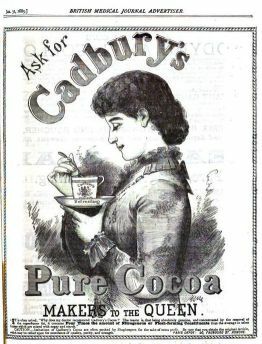 As fanciful at the ad shown here is (“Ask for Cadbury’s Pure Cocoa, makers to the Queen”), there is a wealth of more prosaic ads in the same volume, awaiting future medical historians, on subjects such as malted infant food, lactopeptine for indigestion, bronchitis & croup kettles, and state-of-the-art wheelchairs. So, how searchable are the ads in Google Books? I tried a few examples and had mixed results — Searching for this phrase that’s in the Cadbury’s ad — “why does my doctor recommend Cadbury’s Cocoa” — was successful. But searching for a phrase in the ad that follows the Cadbury’s ad, for Anodyne Amyl Colloid — “in cases of neuralgia, sciatica, lumbago” — found the phrase in other ads for the same product, but not the one occurring in this instance. Posted in Google Book Search, Journals, PicsYes, Uncategorized. The list presented here has FULL VIEW (public domain, pre-1923) journals in Google Books. This is certainly NOT intended to be a complete list! There’s no easy way that I have found to limit a search in Google Books to journals, so I have found these titles by searching for appropriate words such as medical, dermatology, journal, archive, transactions. I have not included titles that have less than 5 volumes in Google Books. Unfortunately, there’s no way that I have found to sort the title searches chronologically, so to find a particular volume, it’s necessary to go through the results list. Each entry in the list below has links to the first and last volumes that I have found for each title; these dates are not necessarily inclusive. For “contributing libraries,” examples are given if there is more than one contributing library. Posted in Google Book Search, Journals, PicsNo, Uncategorized.